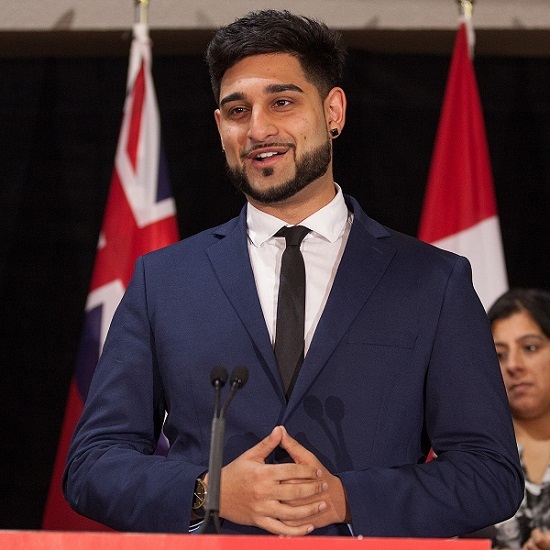 MISSISSAUGA, Ontario - March 30, 2018 - PRLog -- Wali Shah, renowned spoken word poet and public speaker from Mississauga, Ontario will be honoured by District 86 Toastmasters for his achievement in the field of communication and leadership. The event will be held at the Communication & Leadership (C&L) Luncheon on Saturday, April 28 during the District 86 Spring Conference at the Hilton Meadowvale in Mississauga, Ontario. The Communication and Leadership Award is presented by the District to a non-Toastmaster in the community who is an outstanding communicator or leader as well as a person who best exemplifies Toastmasters International values. Toastmasters District 86 recognizes Shah's numerous contributions in improving the lives of people in poetry and social change in Ontario and across Canada. He has delivered many poetry workshops to schools across North America and has performed at poetry events for many corporations including Microsoft Canada and the Canadian Football League. Shah is also an accomplished musician appearing on MTV, CTV and has performed with renowned artists Kendrick Lamar and Selena Gomez. Toastmasters District 86 Director Cathy Herschell congratulated Shah for winning the award. "His communication and leadership skills as a poet and advocate for social change resonates with the values of Toastmasters Internationals, including: integrity, respect, service and excellence." Shah, one of Canada's Top 20 Under 20 in 2014, currently serves as the Poet Laureate in Mississauga, Ontario where he uses his poetry to promote the profile of literary arts and spoken word in his community and beyond. Wali Shah is a South Asian spoken word poet and public speaker. He is an alumni of Canada's Top 20 Under 20. Shah's experiences range from being a TEDx speaker to performing poetry for 15,000 Microsoft Partners at the Air Canada Centre. Shah focuses on youth engagement and has conducted poetry workshops and keynote assemblies at hundreds of schools across Canada. His work has been featured in media outlets such The Toronto Star and MTV. Toastmasters International is a worldwide non-profit educational organization that empowers individuals to become more effective communicators and leaders. Headquartered in Rancho Santa Margarita, California, the organization's membership exceeds 352,000 members in more than 16,400 clubs in 141 countries. Since 1924, Toastmasters International has helped people from diverse backgrounds become more confident speakers, communicators and leaders. For information about local Toastmasters clubs, please visit toastmasters.org. Follow @Toastmasters on Twitter.